Overview — The chain catshark looks like something a modern artist would have designed. Its smooth yellow and brown skin contains brownish-black markings along its body and dorsal fins. These marks resemble a chain, hence this shark's name. Feeding Habits — Scientists in 1988 conducted a "gut content analysis" of chain catsharks. This involved cutting open shark stomachs to determine what they recently had eaten. The study, performed on 81 individuals, determined that 64 percent ate squid; 55 percent consumed bony fishes; 32 percent ate marine worms, such as the lugworm or clam worm; and 21 percent had eaten crustaceans, such as lobsters, shrimps and crabs. 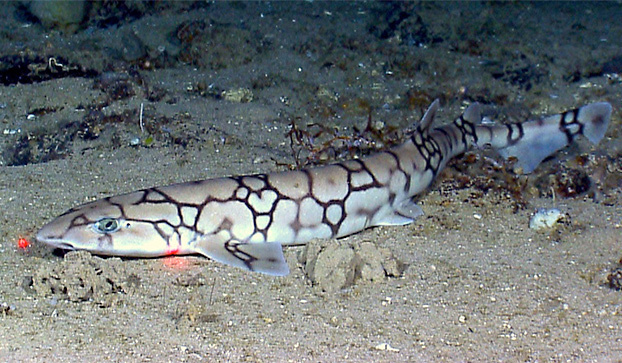 Cool Fact — Chain catsharks often remain motionless on the sea floor, camouflaged by their skin's unique color and pattern.